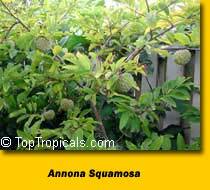 SoursopPuree.com is sponsored by iTi Tropicals, Inc.
Of the 60 or more species of the genus Annona, family Annonaceae, the soursop, is the most tropical, the largest-fruited, and the only one lending itself well to preserving and processing. The fruit is more or less oval or heart-shaped, some times irregular, lopsided or curved, due to improper carper development or insect injury. The size ranges from 4 to 12 in (10-30 cm) long and up to 6 in (15 cm) in width, and the weight may be up to 10 or 15 lbs ( 4.5-6.8 kg). The fruit is compound and covered with a reticulated, leathery-appearing but tender, inedible, bitter skin from which protrude few or many stubby, or more elongated and curved, soft, pliable "spines". The tips break off easily when the fruit is fully ripe. The skin is dark-green in the immature fruit, becoming slightly yellowish-green before the mature fruit is soft to the touch. Its inner surface is cream-colored and granular and separates easily from the mass of snow-white, fibrous, juicy segments-much like flakes of raw fish-surrounding the central, soft-pithy core. 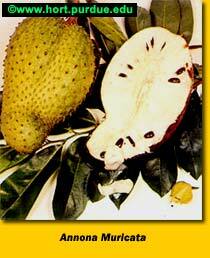 In aroma, the pulp is somewhat pineapple-like, but its musky, subacid to acid flavor is unique. Most of the closely-packed segments are seedless. In each fertile segment there is a single oval, smooth, hard, black seed, l/2 to 3/4 in (1.25-2 cm) long; and a large fruit may contain from a few dozen to 200 or more seeds.